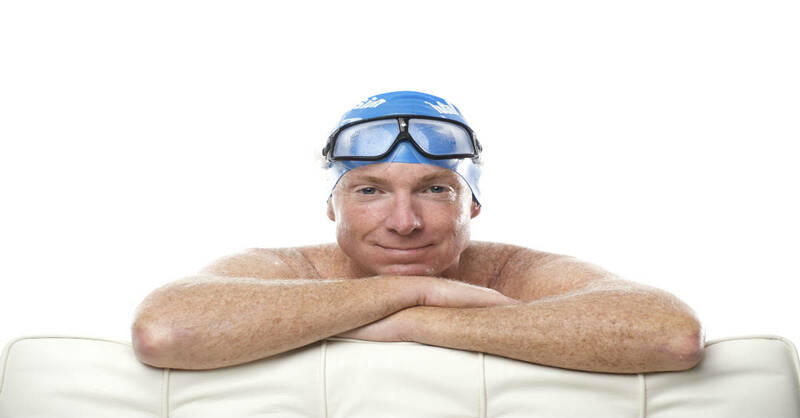 In Part 5, Three Speed Problems, we established that workouts which focus on building Bigger Lungs, Bigger Muscles and Faster Strokes fail to address the three factors – Energy, Drag and Age – that are most responsible for keeping us from swimming faster. In Part 6, Do Less, Get More we showed that the main reason Alain Bernard collapsed in such a shocking manner on the final 25 of the Mens 4 x 100 Relay in Beijing while Jason Lezak stormed by to win the gold was that Bernard’s Stroke Length collapsed, while Lezak maintained his (while both increased Stroke Rate.) Bernard took 28 strokes on the final 25, while Lezak took 19 — a jaw-dropping 32 percent efficiency advantage that decided the race. This is what I call a ‘canned’ workout. 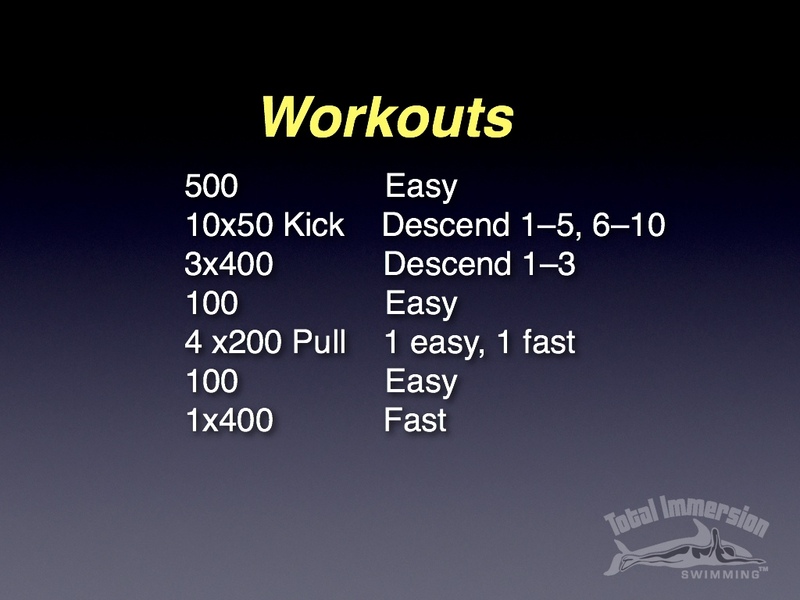 It’s influenced by formulas that are supposed to improve your aerobic conditioning. 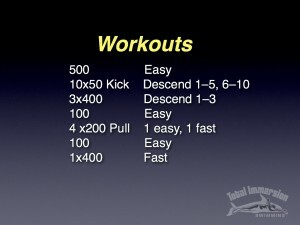 Every set focuses exclusively on how far, and how hard. It’s also One Size Fits All. There’s nothing in it specific to your needs, goals, body type or skill level. Since Stroke Length is the #1 predictor of how fast you swim, then it makes sense that Stroke Length (or Strokes Per Length) should be a key factor in your practice. An important question is: What Stroke Count should you aim for. This chart will help. The chart is intended as a broad – yet still meaningful – guide. If your stroke count is higher than the range for your height it’s highly likely that pool Balance and Streamline skills are to blame. Target those skills . . . keep repeats short . . . and take as much rest as you need . . . until your stroke count is fairly consistently inside the prescribed range. After that, all practice-planning decisions – how many repeats, how long, how fast — should be guided by how they affect your stroke count. Instead of generic training aimed at Bigger Lungs and Muscles, you’ll be doing personalized training that focuses on the aspect of swimming which has the greatest influence on your speed. 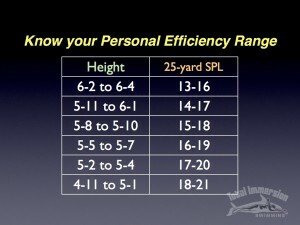 When translating these figures into metrics I find them somewhat high… My height is 6ft1 (183) and reading the table tells me I’m supposed to be in the 14-17 SPL range for 25yd. Allowing 5m for push-off leads to a factor of 1.12 in order to convert to 25m. That will allow me 16-20 SPL, I consider that A LOT! Before I started swim TI I used 12-14 depending on speed, now I use 8-11, almost half of what you suggest in your presentation. Most of the time I push-off longer, say 7m but still it’s just one stroke. I suppose you’re counting each hand entry? If you are your Stroke Length is considerably greater than mine. 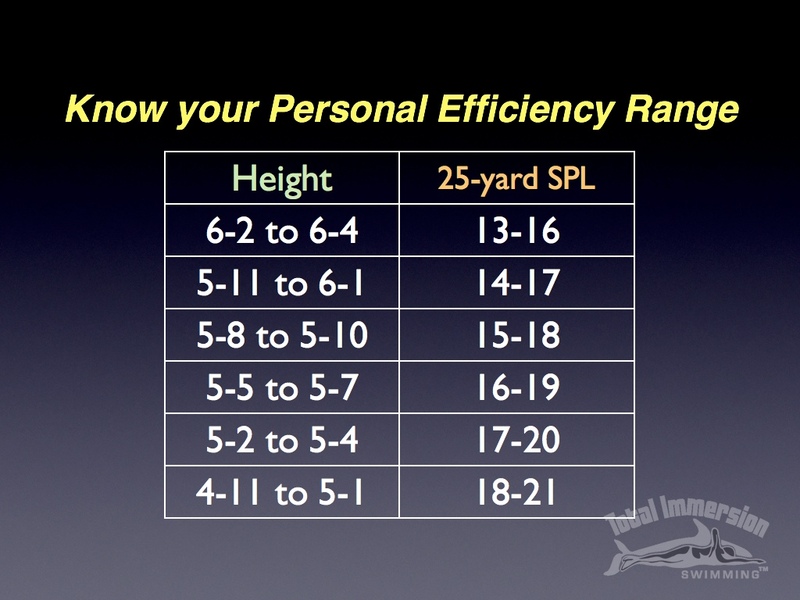 The ranges I included in that video were intended to be conservative – to set initial targets for swimmers who had not previously been counting strokes and therefore not been focused on efficiency. It is certainly possible that a more skilled and experienced swimmer could improve on them. I cannot get my stroke count down to 20. I have been trying for a year or more. I am stuck at 23-25 usually, sometimes I can do 21. I studied both the dvds and took a course at the Y with a TI instructor and I practice every day. Not only that, I am very slow, over a minute for a 50. Any suggestions? Can you please tell me how you count a stroke. Is a left and right arm movement equal to 2 or 1 strokes? Either method works, so long as you use it consistently. When you count each arm entry, you’re counting STROKES. When you count only one side, you’re counting STROKE CYCLES. I have always preferred the former–counting strokes.